Have you ever felt as though you were wandering through life, just existing; trying to make it from day to day? Yes you believe in God, and you believe that God is in control, but you just don't have a true direction or purpose for your life. Year after year, you've been hoping for a breakthrough; hoping that God would reveal a new direction, a new path that would lead you to your destiny, but obstacles and addictions have kept you from truly possessing the promises of God, and now you in a rut; stuck in a dry and barren place in your life. The vision you once had for your marriage, your family, your career, and for your life, has been darkened by years of disappointment and despair. If you are stuck in your wilderness today, you don't have to die there. There is a way out. 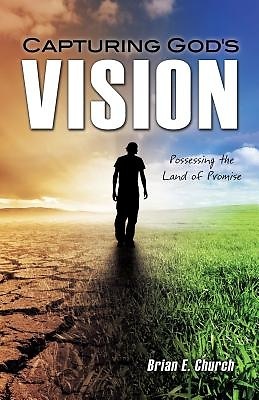 If you are ready to step out of your wilderness state and into the promise of your destiny, then it is time to Capture God's Vision and possess the promises of God for a victorious life in Christ. Author Bio: Brian E. Church is the President and CEO of One To One Family Christian Counseling, Inc. He is also the author of "EVEN IF" Possessing a Relentless Faith and Destined by Choice. He is a graduate of the University of Phoenix with a degree in Management, and a graduate of International Seminary in Practical Theology. He is a member of the American Association of Christian Counselors and he is a Life Coach with Operation New Hope in Jacksonville, FL. Brian is also a devoted husband and father of three.